One small stretch of Mediterranean coastline has always epitomised the glamour and sophistication of superyachting. From the fairy-tale kingdom of Monaco along the French Riviera to Saint-Tropez, the very names drip with sophistication: Monte-Carlo, Cap Ferrat, Nice, Antibes, Cannes. A playground for film stars and royalty, sheiks and industrial magnates, the Côte d’Azur never loses its gloss, offering just about everything that is synonymous with the lifestyle of the rich and famous. But its enduring appeal is more than skin deep – beyond the glittering nightclubs and casinos, haughty boutiques, fabled hotels and Michelin-starred restaurants there are relaxed beach clubs, ancient fishing villages, cheerfully casual markets, and tiny delicatessens jammed with locally produced delights. And the blue waters of the Mediterranean lap a coastline that offers innumerable sheltered bays, anchorages and a good selection of marinas. And if you have taken your fill of the hustle and bustle, glitz and glamour, there are still havens of tranquility to be found – the Porquerolles, Lerin Islands and Bay d’Agay to name a few – where you can drop anchor in quiet bays, picnic on secluded beaches or follow a trail inland through olive groves and fragrant thickets of rosemary and lavender. 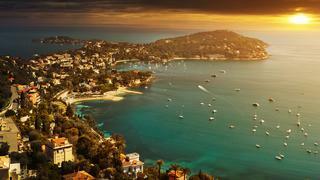 The Côte d'Azur is the superyacht hub of the Western Med. The harbours may be crowded, but that makes for a great social scene! The lovely Iles d’Hyeres are a refreshing change from the intense glamour of nearby Saint-Tropez. On Port-Cros and Ile du Levant you can swim and snorkel in clear turquoise water and feel a million miles from civilisation.